﻿Religious traditions through the ages have externalized the Divine as something “above” and outside of us -- unknowable except through rabbis, priests, preachers and other intermediaries that religious dogma and doctrine deemed worthy or knowledgeable enough to shepherd and illuminate the rest of us. While the 72 Angels tradition emerged from the mystical oral tradition in Judaism known as Kabbalah (which means "the receiving"), like the hidden mystical hearts of most traditions it encourages direct communion with the Divine. The Angelic Kabbalah, however, goes deeper into the mysteries of the inner Divine, what Jesus referred to as the "Kingdom of Heaven within." 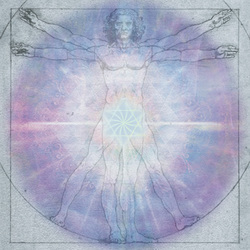 In the 72 Angels tradition, we are invited as individuals to exercise our birthright and deepest soul-calling to meet the collective Angelic Divine Essence that dwells most relevantly and potently within each of us a unique constellation of Divine qualities that support the particular meaning, purposes, challenges and potentials of our lives. The 72 Angels tradition is interwoven with the mysteries of the Tree of Life, and can be traced back to at least the 12th century work of Rabbi Yitzhak Ha-Ivver (Isaac the Blind) in Provence, France (1160–1235). The tradition was reportedly carried forward and further developed by his students Rabbi Azriel, Rabbi Moses ben Nahman (Nachmanides, or RaMBaN) (1194-1270) and other Rabbis and scholars into 13th-15th century Gerona, Spain. Although they were working within the Judaic Kabbalah, influences and contributions from other traditions included: Christian Gnosticism (direct knowing of God through personal communion), Sufism (coming closer to the “inner Beloved” while still in life through love and unity-identification), Hinduism (the many “gods” as the many aspects of the “One Supreme Being” dwelling within awaiting our recognition), Neoplatonism (espousing the “One” and the “Infinite” beyond being, from which all Life is brought forth containing the essence of the Divine One) and Hermetics (the Egyptian and later Greek spiritual alchemy of transforming base mettle into the gold of wisdom and ennobled beingness in order to manifest Heaven on Earth). The Spanish Connection from Medieval to Modern Times. In the 13th century, Nachmanides founded a yeshiva for Judaic and Kabbalah studies in Gerona (also “Girona”), Spain. He was a disciple of Kabbalist Rabbi Azriel of Girona, who himself was a disciple of Rabbi Isaac the Blind. Nachmanides is credited for chronicling much of the oral tradition of the Kabbalah, as well as defending the Jewish position on Messianic doctrine in the court of King James I of Aragon in the Barcelona Dispute of 1263. He was subsequently forced into exile and passed the rest of his life in Israel. In 1492 the school and Jewish grotto were walled up and abandoned during the Conversion/Expulsion Edict of the Spanish Inquisition in which Jews were forced to convert to Christianity or flee. 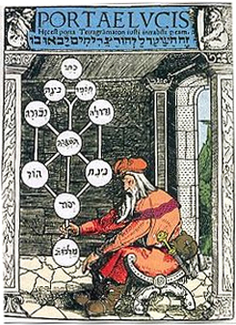 Many of those working with the Kabbalah fled to Safed, Israel, which in the 16th century yielded the works and influence of Rabbis Moshe Cordovero and Isaac Luria (the “ARI”), who worked extensively on the details of the Tree of Life symbology and are considered to be the fathers of modern Kabbalist thought. Today there is still a thriving Kabbalah and arts community in Safed. In the meantime, the medieval Jewish grotto in Gerona (the “Call” or “Cahal”), remained walled-in for almost five centuries until a gentrification trend in the 1970’s and 80’s spurred interest in acquiring and renovating medieval properties. According to accounts given by Gerona historian, Assumpcio Hosta, to Dartmouth professors and travel writers, Harvey and Myrna Katz Frommer, restauranteur Joseph Tarres in the 1980’s had acquired a number of properties in the grotto for the purpose of building a restaurant. During the excavations remains of the medieval school that had been the 13th century yeshiva founded by Nachmanides were found. As recounted to the Frommers by Ms. Hostas, who ultimately became director of the Bonastruc ca Porta excavation project (to honor the Catalan name of Nachmanides), curiosity by the locals eventually turned into commitment as continued excavations revealed that there was once a thriving medieval Kabbalah community in Gerona that gave it a unique standing as the center of mystical Judaism in Spain. Medieval manuscripts which had remain untouched for centuries led to the discovery of hidden Hebrew parchments, and cooperations began with Yeshiva University in New York and the Museum of the Diaspora in Tel Aviv for research, cataloging and translation, which remain ongoing. (www.dartmouth.edu/~frommer/s_j_connection.htm). Kaya and Christiane Muller. I had been initially introduced to the 72 Angels tradition around 1996-97 by French Canadian and Swiss-French teachers Kaya and Christiane Muller, who work with the 72 Angels and dream symbology (ucm.ca/en/info/the-72-angels). As Kaya and Christiane were growing their 72 Angels work in the world, they traveled to Gerona, and through some remarkable meetings discovered more intimate details about the 72 Angels' historical legacy there. They evidently met a man whose family generations had lived next to the walled-up grotto for some 500 years, and who in the 1920's and 30's had climbed over the wall with his childhood friends to play and explore in the grotto. They found hidden manuscripts in Hebrew, Catalan and Spanish, and over time took many of them out and guarded them for safekeeping. It wasn't until the 1970's that they began to reveal what they had and petition the town to excavate the grotto -- which eventually occurred. If you are interested to read more about their story, see Kaya's and Christiane's website at ucm.ca/en/faq/what-is-the-origin-of-the-traditional-study-of-angels. My Work with the 72 Angels Tradition. Kaya and Christiane had introduced me to the French works authored under the names "Haziel" and "Kabaleb," which go into extensive detail about the 72 Angels and their astrological correspondences. My interest in the tradition grew in part because of its correspondences to Christian mysticism and to "inner tuitions" I had been receiving for years about spiritual matters. After working with Kaya and Christiane for a couple years, I continued with my own explorations and experiences with the Angelic Energies, which ultimately led to the publication of Birth Angels ~ Fulfilling Your Life Purpose with the 72 Angels of the Kabbalah (2004 Andrews McMeel/Simon & Schuster). After some years of teaching workshops and doing further work with the tradition, in 2013 I was deeply urged to create a work that would give the Angelic Energies a "voice" for our time, and a practice for amplifying soul-awareness and bringing our inner Divine into the details of our daily lives. Over a period of almost three years, I co-created with the Angelic Energies a 5-volume series of Daily Wisdoms, entitled Birth Angels Book of Days, spanning an entire year of daily readings. During the third round of edits, I felt urged once again to discover more historical information, and I appealed to my "inner Angelic Divine" for some help with this. The next day I was contacted "out of the blue" by a woman in Spain, Linda Wheeler Bryant, who as it turned out, was acquainted with the children of Enrique Llop, who wrote all the 20th century books on the 72 Angels authored under the names Haziel and Kabaleb. Linda put me in touch with his son, Tristan Llop, who along with his siblings was carrying on his father's work. In subsequent Skype conversations with Tristan, he filled in a lot of the 20th century blanks for me, as well as some details on the true authorship of the Haziel works and certain aspects of the tradition which I had not fully understood previously.